We will celebrate this joyous occasion on February 24, 2019 at our 10am Sunday Service time. The celebration and cake serving will take place after our Sunday Inspiration speeches are over. It is a recognized status of a minister who had demonstrated the consciousness of a lifetime dedication to ministry. Not all ministers are ordained. When a candidate first becomes a licensed minister, they are evaluated annually supplying reports to CSL Home Office demonstrating their experience and work in the life of ministry. The licensed minister may then after a period of time and demonstration of their ministry inaction, apply to be ordained as a minister for life by going before a panel of ministers who inquire more deeply about how consciousness is demonstrating in the licensed minister’s life and in their profession. 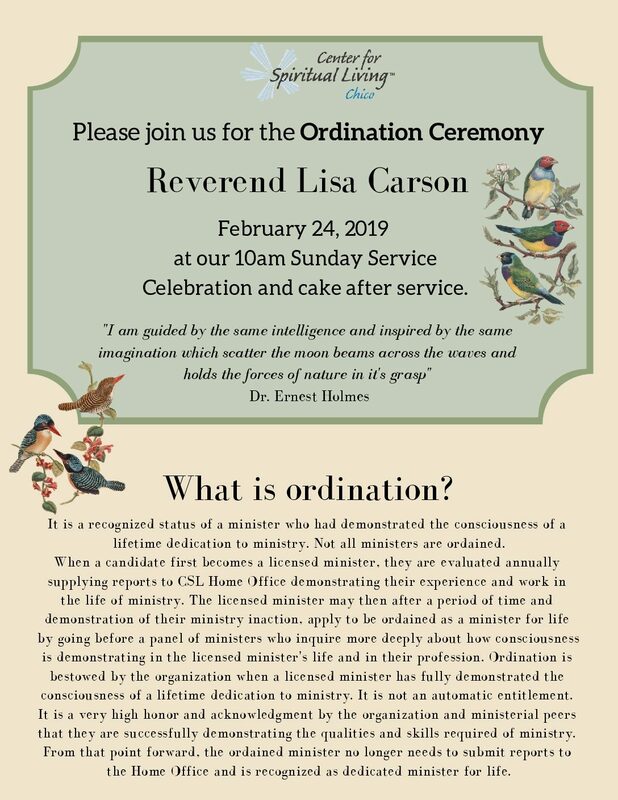 Ordination is bestowed by the organization when a licensed minister has fully demonstrated the consciousness of a lifetime dedication to ministry. It is not an automatic entitlement. It is a very high honor and acknowledgment by the organization and ministerial peers that they are successfully demonstrating the qualities and skills required of ministry. From that point forward, the ordained minister no longer needs to submit reports to the Home Office and is recognized as dedicated minister for life.